Frederick Douglass was born into slavery on a plantation in Talbot County, Maryland, around 1818; the exact date of his birth was unknown to him, but he chose to celebrate it on February 14. In honor of his 200th birthday, we’re highlighting some of his many writings and speeches in the Special Collections Reading Room, in the Brody Learning Commons, M-Level. Drawn from our JHU special collections holdings, the exhibit will remain on view through Friday, March 2. What do you think of when you think of Frederick Douglass? I’m guessing you may have read one of his three memoirs—maybe especially the first, Narrative of the Life of Frederick Douglass, An American Slave, Written by Himself. And you may recall that the “Written by Himself” was a significant part of the title. It was crucial that Douglass claim the authorship of the memoir as his own—and not the work of a white abolitionist—to substantiate the authenticity of the horrifying incidents it described. It was also important for Douglass to demonstrate his eloquence and intelligence, an implicit argument for the ability of the enslaved to perform as citizens. And finally, it was a ringing act of resistance, a defiance of the laws in the slave states that prohibited enslaved people from learning to write: laws that became more widespread and draconian after Nat Turner’s Rebellion in 1831. It’s also pretty likely that you are familiar with Frederick Douglass’s appearance, through the hundreds of portrait photographs that he commissioned once he had escaped slavery (via Baltimore in 1838) and become a noted abolitionist leader. Indeed, Douglass was “the nineteenth century’s most photographed American.” He used these portraits in tandem with his autobiographies to “prove” his Black identity and the accuracy of his accounts of life under slavery. But he also deployed these portraits in a life-long public relations campaign. Through his consistently dignified self-presentations, via a brand-new technology, photography—one that nineteenth-century people considered a truth-telling medium—he worked against the many racist depictions of Blacks that saturated popular culture. He was way ahead of his time in his understanding of the influence of images. Douglass was a savvy communicator in a variety of media, in fact. Did you know that his first memoir was so popular it sold 5000 copies in four months, and went through six new editions in four years? Did you know he was a contributor to, an assistant editor of, and finally the lead editor of several abolitionist newspapers? He launched the weekly North Star in 1847, with funding from British supporters; in 1851 it merged with another newspaper to become Frederick Douglass’ Paper; and then became a monthly in 1858. 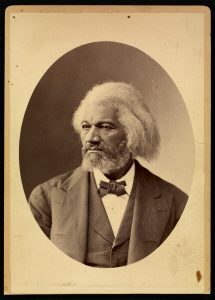 Douglass used the platforms available to him to reach a variety of audiences. A prolific and intellectual activist in the Black freedom struggle, he was also an ardent supporter of “all rights for all”—the motto of Frederick Douglass’ Paper, where articles against the Fugitive Slave Law appeared alongside reports on the women’s suffrage movement, accounts of violations of the rights of disabled persons, and news about the freedmen’s Colored Conventions. But you don’t have to take my word for it. You can read for yourself some of Douglass’s many speeches and writings, and even get a sense of how he wrote through the Library of Congress’s collection of his papers. Or, for a truly immersive experience, visit his former home—the Frederick Douglass National Historic Site in D.C. Happy birthday, Frederick Douglass. And thank you.